I enrolled in a Ph.D. program in historical theology at a Catholic university. Part of this program was a seminar with various readings to help us get oriented to what history is and how we should approach it. One of the first readings, possibly the first, was Stafford Poole’s History versus Juan Diego (PDF). The article had the ring of truth as far as the story it sketched out, but it is quite a grave matter to tell budding historical theologians that this is the sort of thing that should orient their study of history and historical theology. The article raises grave concerns about the very existance of a major figure in Mexican piety and nationalism; the comparable equivalent as far as U.S. nationalism to go would be to uncover good reasons why we should believe that neither Thomas Jefferson nor Benjamin Franklin ever existed, and the only “evidence” that anyone believed in either of these men before the Civil War was a complete forgery. The lay faithful and clergy who disagreed with the author come across like the Three Stooges. The article may have been appropriate in itself, and in this case the historian may have legitimately been a figure like the little boy who saw that the emperor had no clothes. But to enshrine this article in a seminar meant to give an orientation to history is another matter entirely, and paints the inspiring, romantic image of the heroic, noble historian who delves past popular piety and the decisions of clergy up to and including the Pope, heroically rips apart a cherished fixture that neither the faithful nor Church officials are noble or brave enough to question, and his trust is shamefully betrayed by the Vatican. Making this a paradigm example of how a historian should interact with Church hierarchy and popular piety is like holding up, so people can get their bearings, a singularly improbable story about how someone, who was drunk, blindly shot a gun into a building and hit a fire extinguisher, putting out a deadly fire and saving several lives. The problem is not so much the original event, but the fact that the extremely unusual story is being used to give the impression that it is a good idea to get drunk and randomly shoot guns around in a city. My response was received very kindly, and welcomed as a breath of fresh air, but it was completely different from anything I had heard in the class up to that point. In the midst of discussing what scholars should do if their research collides with the Church, no one seemed to even consider the possibility that the discrepancy could be handled pastorally on the part of the researcher. There is a big difference between having a doubt and pressuring the Church to agree with you, and having a doubt which was handled pastorally. I remember one conversation with my godfather, who was complaining about people broadcasting their doubts in the fashion of a dissident theologian, and he saw this as a major problem. But he liked what I suggested about “private doubts,” meaning doubts that were handled pastorally and privately, struggled with, and brought to confession. As far as “private doubt” is concerned, if you need to privately struggle to believe the deity of Christ, or the Church’s teaching on some aspect of sexuality, fine. It may not exactly be good, but people bring all kinds of sin to confession, and if an Orthodox Christian has doubts in light of scholarly study, this is no more unforgivable than any other sin that gets obliterated in confession. Doubts may be unfortunate, but if these doubts are handled as private doubts and dealt with pastorally, this is not the world’s biggest problem. This point is why I was somewhat puzzled at journalists making a big to-do over the public announcement that Mother Theresa had painful doubts about God’s existence. (Some asked if she was really a crypto-atheist.) I was underwhelmed at the revelation and wanted to ask, “So?! ?” We might have sympathy for her difficult spiritual struggle, but she evidently treated her doubts as private doubts, brought them to confession, and still served God in love to her neighbor. That is about as much as one can ask. Are scholars’ difficulties really that different? This is related to why I am a bit bothered when someone who reads the Bible devotionally shows respect to a scholar by saying that his own Bible study is just lightweight and insignificant, but the scholar with access to historical sources is doing the real, serious Bible study. It may be great if they can be humble and out of their humility respect the work of scholars, but the Bible is given by God for devotional use and it is backwards to say that the devout layman reading the Bible is making a flimsy and insubstantial study next to the serious work of scholars. I’ve seen a lot of methodical scholarship that is not nearly as interesting as the devotional reading of common people, and in theology it is simply not true that scholarship is the industrial strength tool to really understand things. I know that it may appear plausible, even obvious, to place scholarship in a separate category as far as doubt and dissent goes from doubts among the rest of the faithful. But my own experience casts doubt on this. I may have seen liberal Catholics doubting the Vatican’s condemnation of contraception. I do not remember if I have ever read a dissident who tried to fairly understand theological and historical sources and come to their dissident position even though they tried very hard to give their Church’s official position the benefit of the doubt. The invariable trend is to write something that sounds like people who want contraception for the same reason most moderns want contraception, and thenshanghai whatever academic resources they can force to back them up. If you’re Orthodox, are you tempted to say, “Duh, you’re talking about Catholic dissidents! It is the sworn duty of His Majesty’s Loyal Opposition to oppose, and you can count on His Holiness’s Disloyal Opposition to at least do that much. But Orthodoxy has none of those problems”? Almost every issue described above with Catholic dissidents is also something I’ve seen in Orthodoxy, perhaps on a smaller scale. The biggest thing I remember about one Orthodox scholar’s lecturing is the consistent meta-message, never put in so many words, that the way we should relate to the ancient works of holy Fathers is ultimately with haughtiness and scorn, as we could unmask what the texts really were like. Nor is it just this one professor. If, in our age, humanities scholars rehabilitate figures like the Marquis de Sade, and some academic theologians rehabilitate Arius and Nestorius, then sure enough, Orthodox scholars, who are not exactly free to rehabilitate heretics, at least rehabilitate the much-maligned Augustine. The list goes on. There may be a place for scholarship. But whatever that place may be, it is not a reason to stop handling difficulties pastorally. I know that I have, in my research, turned up stuff that appeared to be a reason to impose a significant change. This has happened more than once, and sometimes I was wrong. I once heard an Orthodox bishop give advice to a newly-ordained priest that he should not set about agendas for change in his parish-to-be, even for a pure and honorable purpose that is unquestionably right. That is to say that a priest can be right about something with respect to a parish under his care, and it is not his place to whip it into shape. And if it is not the place of clergy in authority to whip a parish into shape, still less is it the duty of researchers to apply political force to straighten out a benighted hierarchy who don’t see things their way. But what if you are right? But what if you’re right? And your words are not heeded? Then there may be sin in the picture, but the sin does not belong to you. St. Paul, at the end of his life, had greater achievements than one would expect of a Nobel Prize laureate. He could have written to St. Timothy, “Veni, vidi, vici!“: “I came, I saw, I conquered!” But what he wrote instead was, “I have fought a good fight, I have finished my race, I have kept the faith” (II Tim 4:7): he did not say, “I achieved,” but only, “I was faithful,” and in our life of faith it is not our responsibility to achieve, but only to be faithful. There is a profound difference between Dante and Luther, to give a Western example, and it is not really which centuries they lived in: both lived in troubled times where there were major problems in the Roman Church. Dante and Luther alike were absolutely incensed at abuses they knew full well, and one surprise to naive Protestants first reading the Commedia is that Dante placed the Pope in Hell and seemed to treat the Pope’s very name as an abomination. The difference between Dante and Luther is this: Dante remained to his dying day a loyal son of the Roman Church, but Luther took matters into his own hands—and created problems that are with us to this day. What we should aspire to is discipleship: sitting at the feet of the Lord, the Church, the Apostles, the Fathers, the clergy, and the faithful. The academic approach that is called “critical” may be enough to grasp logic, but it utterly fails to grasp the Logos: what makes a theologian and a teacher is not being critical par excellence but being a disciple par excellence. The paradigm example is not “…the inspiring, romantic image of the heroic, noble historian who delves past popular piety and the decisions of clergy up to and including the Pope, heroically rips apart a cherished fixture that neither the faithful nor Church officials are noble or brave enough to question, and his trust is shamefully betrayed by the Vatican.” It is rather everything that such a scholar would seek to push past. Perhaps I am pushing my own romantic image and ripping up cherished fixtures of my own. But to an interlocutor concerned about irony, I would not deny that I am pushing a romantic image, but rather I would suggest that I am pushing an image that is worth pushing: that of discipleship, that of sitting at the Lord’s feet, that of divine sonship, that of being a servant at the Lord’s disposal, that of living the divine Life. It is not the knowledge of the Enlightenment’s version of Reason, but a knowledge that runs deep as the Song of Songs: the knowing that drinks and the drinking that knows. Let me give one illustration from my own life. Even from very early on, I remember the local priest telling me that, contrary to the prohibition of contraception I expected, the Orthodox Church holds that it can be allowed or disallowed by a couple’s priest after consultation, that it was not permissible to decide not to have children altogether, and the Orthodox Church has never spoken beyond that. I submitted then to Orthodoxy and accepted what he said. Then, later on, I found a really nasty surprise: despite ancient Orthodox condemnations of contraception, a spin-doctoring doozy of an article had apparently been taken simply as a straightforward account Orthodox teaching. And I wrote Orthodoxy, Contraception, and Spin Doctoring: A Look at an Influential and Disturbing Article, and apart from showing it to an Orthodox priest or two and some trusted faithful, kept it off the record for a long time. 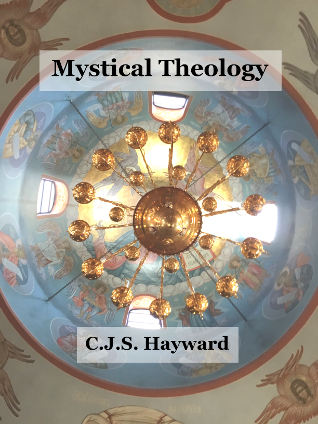 And then, after a long time, I published it on CJS Hayward, and later, after publishing it, found that I fit in as part of a quite broad consensus on an excellent online Orthodox forum. What would I do differently if I had to do it over again? The answer is that I probably published my article too quickly: however important the issue may be, I might have done well to wait until later on. But I do not regret, as I was moving towards Orthodoxy, accepting the priest’s word for what Orthodoxy taught, even though something about it seemed wrong at the time. Nor do I regret sitting on my writeup and do nothing with it for a long time, besides bring it up with a few people off the record. I believe it is an important issue (and anything but a matter of correctness for the sake of correctness: contraceception bears some nasty hidden price tags), and that discipleship is more important, so that it is a fundamental error to let My Important Issue trump living and acting as a disciple. Even if I were right and the Church leadership had responded sinfully and wrongly, the sin would belong to them, not me: my concern and duty is discipleship. It would be sin for me to decide it was my place to whip the Orthodox Church into shape, even if I happened to be right about what I thought of as the only issue! Scholarship and discipleship can be found together: some excellent theology has been written by scholars and in an academic context. However, genuine theology is theology because it comes from discipleship rather than scholarly rigor. Even the more academic examples of good theology are good by virtue of discipleship: to ask the scholarly training shared by Christian and anti-Christian scholars alike to power the movement of good theology is like asking a computer with a word processor to be the decisive force in writing a good novel. A word processor is a useful tool and perhaps not wisely ignored: but do not bark up the wrong tree by asking it to make someone a novelist, and do not bark up the wrong tree to ask scholarship to make someone a theologian. For a theologian to push an agenda to improve the Church makes sense if you think theology falls under the heading of scholarship. But once you understand theology as a flower of discipleship, the picture starts to look quite different. Theology in its deepest sense cannot be held by books at all: it is contemplation and the flower and the fruit of discipleship. But even for those of us who may never climb so high, the sort of theology one can write down is a flower and a fruit of discipleship. And it seems that academic research is rarely allowed to veto whatever orients a person’s life: conservative and liberal alike go to the sources and return with their beliefs confirmed. It takes something fundamentally vaster—living discipleship in the Church—to unlock the heart of theology.